Back in October last year, we introduced a major programming initiative - World War One at Home - which formed part of the BBC's World War One centenary coverage. In just a short time now, on February 24, the BBC’s Nations and Regions will launch World War One At Home - one of its most ambitious projects to date. Here's some background on what we've been doing. For the past year, 60 BBC producers all over the UK have been working intensively in their own programme areas to gather 100 stories across eleven English regions and the three nations (BBC Scotland, BBC Wales and BBC Northern Ireland). The producers have been taking a detailed look at how ordinary lives here at home were affected during the War and I'm really looking forward to them blogging about some of their early discoveries on the About the BBC Blog in the coming weeks. Over the next couple of years we will be sharing these stories with audiences across the UK - each story linked to a place touched by the war, and told through the eyes of those living nearby. 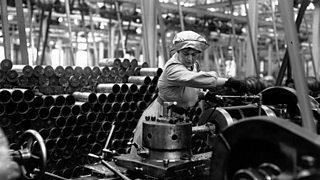 World War One at Home will feature uplifting stories of great bravery; amazing developments in technology; stories of how women’s place in society changed forever; what it was like to grow up as a child in this, most terrible of times; stories of love, of hatred; of desertion and execution. The stories our journalists have found will surprise, shock, inspire and delight you. From 24 February, you will be able to hear each one across the BBC’s 39 local radio stations, and on the national TV and radio stations in the nations. Every tale will have its own dedicated webpage accessed via the main BBC World War One portal at www.bbc.co.uk/ww1 - the site will be updated on a regular basis throughout the year. Some stories will also go out on the BBC News channel and beyond. World War One at Home is a project which plays to our strengths in Nations and Regions – telling stories steeped in a sense of place, through the eyes of the people (and their relatives) who lived through the First World War. Our major partner in this endeavour is Imperial War Museums. Their support, combined with the expertise of academics provided by the Arts and Humanities Research Council gives us access to stories, archive and (most crucially) the facts to ensure this great super-tanker of a project stays on course. As we enter the final countdown stage to launch, our ambition is for World War One at Home to shine a new light on a devastating war which changed the course of world history. I hope you will come away with new insight into its impact right on your own doorstep too. Craig Henderson is Head of English Regions Programming. Read Adrian Van Klaveren's blog '1914: 100 Years On'. Visit the BBC Media Centre website to explore a media pack about the World War One centenary. See the World War One Centenary website for updates.